It’s official, summer is over and it’s time to start rockin’ the autumn trends. Is this even possible when you are pregnant?? Some of the trends I’ve seen this autumn involve bold patterns, super shiny coats, baggy leather pants and cowboy styled paraphernalia. Hmmm, not so sure how this will match up with a huge baby bump but it’s worth giving it a go. It’s all about the boots, this season it’s the ankle boot! This is where you could inject a bit of that cowboy style as I’ve seen some lovely ankle cowboy boots. 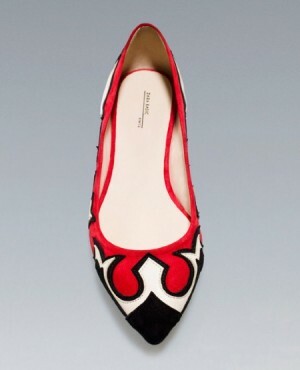 Or try these cool flats, which also have a bit of a cowboy theme. Pair knee length boots and skinny jeans – you can’t go wrong. Long, tall boots are a great way to keep a bit warmer, and show that your summer clothes have been put away. Geometric prints is another key trend, but one that might be a bit trickier to pull off with a baby bump. You could try a patterned scarf or patterned leggings (?) but you might want to stay away from patterned jumpers as it could make you look bigger, and not in a flattering way 😉 Someone like Fearne Cotton (who is now pregnant!) is sure to boast some of these fashions, as she never dresses without some degree of rock n’ roll! Fearne can get away with this printed dress as she is barely showing in it, we think it looks fab! Michelle Obama is usually referred to now as a style icon. Her key message is to ‘have fun with fashion’, something we could all do. She loves to use colour! http://www.guardian.co.uk/fashion/2012/oct/05/autumn-style-icons-michelle-obama This is a definite way to stay on trend when pregnant, using some colour with the basics or mixing and matching. Oversized coats are apparently the rage as well (http://fashion.telegraph.co.uk/galleries/TMG9503121/Fashion-trends-autumnwinter-2012-and-how-to-shop-them.html see #6) and these will work well to keep you warm through your pregnancy. You may even be able to wear it after you’ve had the baby. I have a coat from French Connection with two upper buttons which had plenty of room for my bump, and now it still looks great post-baby. Another funky autumn trend is crisp pairing of black and white, with a suit type of look. 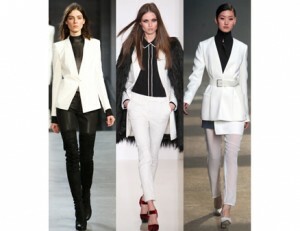 Think white blazer over a black roll-neck top and black skinny jeans. You could definitely carry it whilst pregnant, but I wouldn’t reverse the black and white and wear white trousers in the autumn. Some could probably get away with it, but I was always told white was a no-no after 1st of September. But due to this trend, I may just pull out my white blazer for a little more wear!! Any autumn trends of 2012 you’ve heard of that we’ve missed?? Do you find it hard to stay on trend whilst pregnant?